The Earth Stone is located northwest from Raven Rock as shown on the paper map. 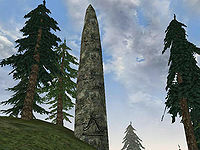 Far south of the Water Stone, the Earth Stone pillar is barely visible from the shore line and is on the top of a small hill in the forest. It is one of the six All-Maker Stones sacred to the Skaal and is involved in The Ritual of Earth. The Ritual of Earth: Learn the Song of the Earth. There is a small chance that a Gibbering Lunatic – a male level 88 Breton barbarian – will spawn just north of the Earth Stone. He turns into a werewolf between 9pm and 6am. This location makes an appearance in the Dragonborn expansion of Skyrim, although southwest of Raven Rock instead of northwest. This page was last modified on 8 July 2013, at 16:34.